There are three simple steps we can take to have a mindset for success that many people who struggle with success simply don’t have. It’s when we have a fixed mindset about how things should work, or what success should look like that we limit how successful we can be. The first step to take to create a mindset of success is to have a growth mindset. What tends to separate those that succeed at their goals and aspirations versus those that don’t are what they spend most of their time thinking about. A person with a fixed mindset is more likely get stuck on limiting thoughts and ideas like they either are or aren’t good at something because of who they believe they are. Quite often, it’s just the thoughts we think that separate us from success or failure. This person also tends to get overwhelmed by problems that arise along their path to success to the point where they find it easier to give-up on their dreams and desires than to push through their own limitations. In reality, these are just excuses to quit because deep down these people believe that they don’t deserve to be successful so why bother going through the pain of trying too much when they will probably fail anyway. This is the kind of self-talk that you will find in people with fixed mindsets. On the other hand, people with a growth mindset are constantly challenging themselves mentally to have the right mindset that supports what they want to achieve in their lives. So what exactly does a growth mindset look like? These people understand that intelligence can be developed, and with increased intelligence comes better decision making and action taking. They also believe that anyone can be good at anything if they are willing to put in the time and effort to make it happen. The growth mindset focuses on constant and never ending improvement as a way of life, and rather than getting beaten down by obstacles they focus on turning them into opportunities to learn and grow. 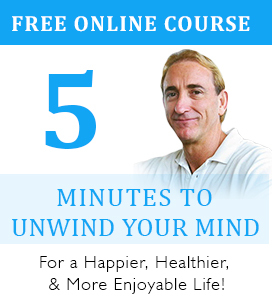 The great news is that your mindset itself is not fixed. You can change your mindset anytime you like – all it takes is to decide which mindset you want to have and then live accordingly. As long as you take actions that support your decision, then you’ll find that instead of fearing failure you’ll develop mental muscles of courage. 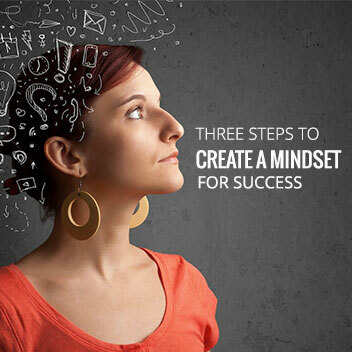 Let’s have a look then at what the other two steps are when we are looking to develop a mindset of success. The next step is to be crystal clear about what you want. Not just some whimsical idea of something you want to be, do, or have, that’s more of a wish rather than a burning desire. It’s got to be something that you REALLY want, and that you have written down on your life’s goals list and put a date against when you want it by. Then you need to be prepared to take consistent and non-stop action towards making it happen. Most of all, you’ll have a no-quit attitude towards it. That means that no matter what obstacles come your way you’ll focus on finding a solution regardless of how long or how difficult the road is. The third and last step to having a mindset for success is to stay focused on the big picture of where you’re headed and not on the small picture of where you are at. The small picture are all those thoughts and experiences you have that cause you to doubt where you are headed, or make you feel like giving up. Whenever you find that you are struggling to keep moving forward with any goal or dream, then you’ve most likely forgotten to focus on where you are going, and more importantly, why you want to get there. You’ll find that it’s your reasons why you want to do things like; start your own business, lose weight, get healthy, find true love, travel the world, or whatever is important to you, that are the real driving forces behind your motivation to stay on track. That’s why it helps to spend five minutes each day focusing on what it is you want and imagining what it is like to have it in your life. 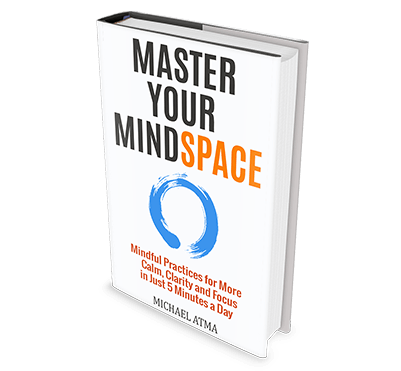 Your mind is such a powerful tool that even just spending a few minutes daily picturing your desired outcome in your mind and making it as real as possible, tells your brain that it is real for you – right now. That’s why people imagine themselves into all sorts of situations that they don’t really want – it’s because they think about something they are worried about or afraid of so many times, that eventually it becomes real. Why? Because that’s how the law of attraction works. What we focus on the majority of the time is what we create in our lives. If you focus on what you want, as if you already have it, then even if you do nothing else you have at least starting building the belief of success in your sub-conscious mind. Surprisingly, when we do this, often times the ‘how’ seems to fall into place of it’s own accord. So don’t get too stuck on ‘how’ you are going to get what you want, as we can’t always know what’s going to be coming our way to support us on our journey to success in our lives. For most people it’s the fear of failure that really robs them of the chance to be more successful in their lives. I know from my own experiences of failing that it was and always will be my failures that have given me my greatest successes in life. At least while I am failing, I know that I am doing something productive, rather than sitting back wishing my life were different. I have failed in business, I have failed in relationships, I have failed in investing, I have failed in sport, I have failed in health, and so much more. But as of right now I have a very successful business, a rich and rewarding life, am happier and healthier than I have ever been, and have deeper and more meaningful relationships than I ever dreamed possible – and all because I have taken my failures and used them as stepping stones to success. Was this helpful? Know that if you don’t give up on your dreams and desires then they won’t give up on you. You can accomplish anything your set your mind to if you follow these three steps I have talked about in regards to developing a successful mindset. 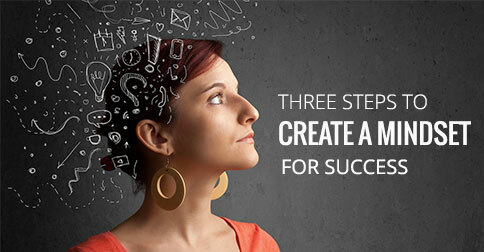 If you enjoyed this post on 3 Steps to Create a Mindset For Success, re-tweet and comment please.